Kyle Shanahan on losing Jerick McKinnon for the year: "I’m not going to lie, it changes things pretty drastically." 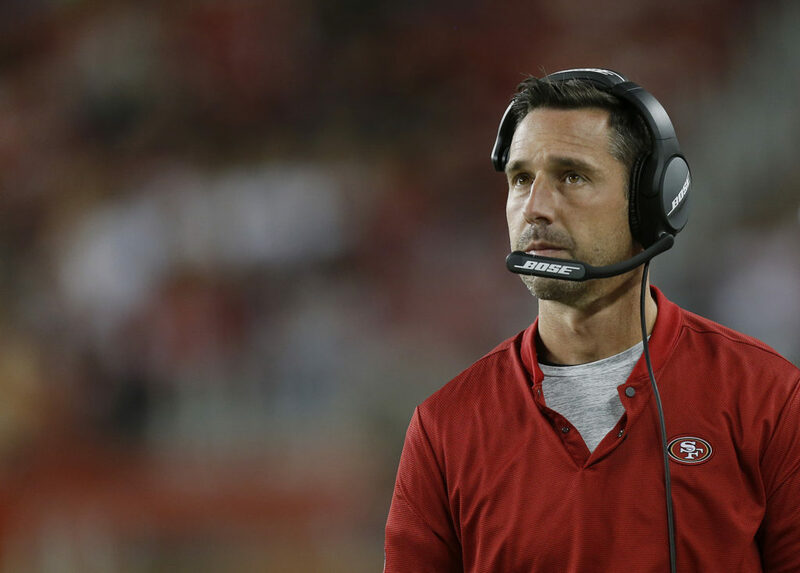 SANTA CLARA — This is the transcript of Kyle Shanahan’s Wednesday press conference, courtesy of the 49ers P.R. department. The very fact that Zim Tzu did that, tells me that he wants to win very much, and will do everything in his power to gain intel. Hikutini will divulge info on the locker room dynamics, and tendencies of certain players. Sure, he did not pilfer the game plan, but he has been on the Niners long enough to absorb something from the team. He can spill the beans on the cadences, and everything that went on during TC. He will be a gold mine of information, and Zimmer will extract every nugget of information he can. Totally discounting the strategy of poaching a player for intel is belied by the fact that Zimmer did it. He actually did what I advocated because it is a smart thing to do. If he did not think it was important, he did not have to sign Hikutini. Of course, you will claim that it is just an amazing coincidence. Hikutini will have a revenge factor, because the Niners cut him, and will spill his guts. KS is just in coach speak, when he downplayed the significance. He even is playing mind games, mentioning double moves, so he just admitted that he expects Hikutini will talk. I do not know how much that intel will produce, but it could be the difference between winning and losing, especially if it is a close game. Sorry son, once again you look stupid trying to pretend you know more than the professionals. Coach Shanahan just slapped your theory right out of the water and you still cannot admit you are wrong. Or perhaps Shanahan has a deal with Hikutini and this whole thing is a set up. Hikutini was sent to Minn. with false information and will be resigned by the Niners at a later date. LOL. Seb is a complete moron. Not sure what else to say really. Before hikutini was picked up by Minnesota we probably had a slightly less than 50% chance of winning this game. With hikutini “poached” for “intel* we will be lucky to lose by less than 50. Against league rules. Educate yourself. Ha!! I was just going to post the same thing. Maybe Hikutini will tell the Vikes all about Solomon’s weight issues….and how John Lynch and Kyle rely so heavily on Sebbie’s contributions. I’m confident Vikings staff jumped on this blog as soon as Hikutini spilled his guts. The Vikings defense will watch closely for 9er RBs falling down as soon as they get first downs… And being careful when Jimmy G looks one way and throws the other. And they’ve secretly widened the playing field so it will harder for our DBs to lift their receivers out of bounds. Curses! Foiled again. Rib, oh look, the DB allowed Jones to catch the ball, but drove him out of bounds on the last play of the game, thus preserving the win for the Eagles……. Pushing an offensive player out of bounds has been around as a tactic since the Ice Bowl. Are you 12 yrs old? How come posters are deriding me for even mentioning it? If they had any class, they would just agree, but they cannot bring themselves to admit that any thing I write has merit. Nothings changed since summer except for the Jet lag. Shanny will have the winning game plan, and we will leave Zimmer reNorseful…. Don’t quit your day job, bud. Hmmm, posters are declaring that no coach should ever bother to poach a player from an upcoming opponent, because no coach has ever done that before, and any intel would be totally useless. Zimmer just did that, and KS expects Hikitini to spill his guts. Now, they are claiming it is just an amazing coincidence, and they are still right. Lmao. I think you’ve had too many California Car Washes for one evening. Folks are laughing AT you, Mr Sebbie, not WITH you. We’ll all laugh together I guess. By seasons end backs the offense will have impressive yardage totals. Backs will get a decent yards per carry, and be pretty good at catching the football. But make no mistake about it, McKinnon’s injury is a major blow months of Shanahan’s planning.